The Denver Public Schools (DPS) and the Denver Classroom Teachers Association (DCTA) jointly sponsored the Pay for Performance (PFP) pilot. This four-year pilot, conducted during the 1999-2003 school years, focused on developing a direct link between student achievement and teacher compensation. 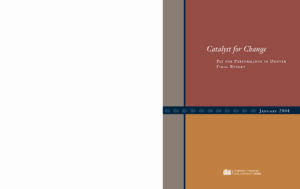 Catalyst for Change is the final report of the results of this innovative collaboration on behalf of students and teachers. This report was released by Community Training and Assistance Center (CTAC).